The food from the land of Ethiopia is a delicacy. There are varieties of flavors that can tease your taste buds. From thick cooked lentils to highly flavored meat, there are varied options that one can choose in this cuisine. Moreover, the special spice of Berbere is a part of the integral part of this cuisine type. Furthermore, there is also the specialty of Ethiopian coffee that is a must have for the travelers. The way the food is presented is equally interesting way as its varied dishes. One of the most famous items of this place is injera. It is used as an edible base on which the different other dishes are served. The locals call it the sociable eating. Food emerges to be one among the main problems for the vegetarians while travelling across the globe. There are places where they fail to find the proper delicious food. However, that is not the case in Ethiopia. Here, there are lots of options for the vegetarian eaters. However, the vegans can still face the challenge. There is special platter of vegetarian dishes that are extremely tasty. The travelers can taste mixed varieties of lentils. You can enjoy varied stews prepared with the help of vegetables. The food ranges from being subtle in taste to extremely spicy. You can enjoy the rich flavors of spices in your food. There is a lot of influence of middle-east in this food of this place. It is mainly because of the historical connections. Name any meat and the Ethiopian cuisine will present it for you. You will get lamb, beef, raw meat, chicken and goat in the platter. They are prepared in delicious dishes. One of the most famous meat dishes of this place is a particular type of chicken stew. This dish takes hours to get prepared. It presents the eaters with layers of tastes within one single dish. It is a specialty that which will not find anywhere else in the globe. Spicy beef and stir fried meat preparations are also considered to be delicacies in the non-vegetarian Ethiopian cuisine. 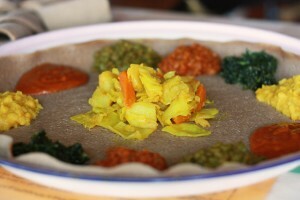 There are also special all meat dishes served on the edible injera. The similar platter is also there for the vegetarian lovers. It will be a great loss if you miss tasting coffee from its birthplace. The coffee that is available in this place has a rich aroma and strong taste. Even the ones made out of instant machines carry the signature of taste. The activities involved in the preparation of the coffee are alluring as the drink. Besides coffee, you can get a taste of the famous alcoholic drink made from honey. The taste and color of this drink changes depending on the alcohol content. Finally, it is fun to take a sip of the Ethiopian Wine. The Ethiopian dishes are sure to take you to a new world of taste. There are different local restaurants than can present you with a true taste of the place. It is a food world that you are ought to visit.